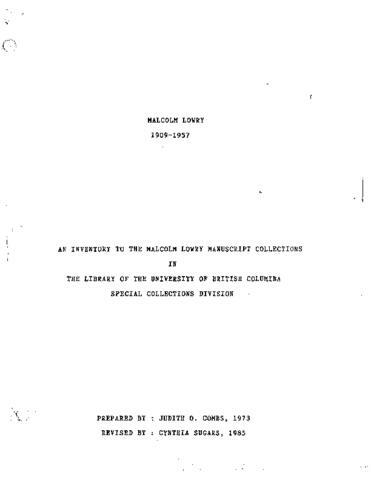 The collection consists of material created by Lowry and others, including Margerie Bonner Lowry, Earle Birney, Dorothy Templeton, and Carol Betty Atwater pertaining to his life and work. It includes correspondence, signed autograph letters and postcards, multiple drafts of manuscripts, poems, phonograph records, clippings, reviews, articles, essays, typescripts, unpublished material and photographs. Photographs include snapshots and professional photographs or Malcolm and Marjorie Lowry, their friends, their houses, and their travels in B.C., the United States, Mexico, and Europe (primarily between 1939 and 1957). Collection also includes Malcolm Lowry's personal copy of his first novel, "Ultramarine", with his pencil notes and edits throughout.